Size of Male: 115 lbs., 27-32 in. Size of Female: 85-90 lbs., 25-29 in. 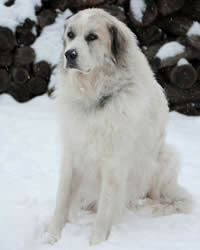 Great Pyrenees dogs are a gigantic breed which may remind you of a polar teddy bear or a white Newfoundland dog. Sporting a calm, regal look, these dogs often elicit admiration from guests and fear from ill-intentioned intruders. Also known as Pyrenean Mountain Dogs, you can’t go wrong with this breed when what you’re after is a faithful pooch that doubles as a trust-worthy guardian in the fields. France is the documented birthplace of Great Pyrenees dogs, but some theories suggest that the breed originated from Siberia or Tibet and then reached Europe through migration. The Pyrenean mountain range which divides France and Spain inspired the name of the breed. From the medieval times until the 17th century, this dog breed remained a favorite of French nobles for their ability to guard fortresses and flocks. Louis XIV even declared the Great Pyrenees as France?s official ?royal dog? during his reign. The breed’s population dwindled in the 19th century, only to be revived when the dogs reached American soil and caught the fancy of their 20th century fans. A very protective breed, Great Pyrenees dogs are markedly affectionate to your household but cold and even hostile at some point to outsiders and other animals. The dogs are gentle with children, but their bulk makes them a tad clumsy and risky for smaller kids. In some cases, bossiness may also be seen. Living Environment – This dog breed thrives in cool places, even those capped with snow. They are extremely sensitive to warm weather but can live either indoors or outdoors. Because of their bulk, access to a yard is recommended. Secure your fence, because wandering Pyrenean Mountain dogs can stray away for good when given the chance. You may want to get a quieter breed if you reside in a crowded neighborhood. The dogs are notorious for their loud barking. Grooming – Be warned that the dog is a heavy shedder and a profuse drooler. Daily combing should be done during the annual shedding periods. Otherwise, brushings every other day will suffice. Raising a Great Pyrenees in your home is synonymous to making daily cleanups a lifelong commitment. Diet & Exercise – A lamb-based diet is strongly suggested for the breed. The fatty content helps to maintain the dog?s beautiful coat. During the first year, meals must be served 4 times daily. As Great Pyrenees dogs age, decrease the frequency but increase the serving size. Corn products should be avoided. Most dogs of this breed enjoy hiking trips and sled pulling in the snow. The breed has average exercise needs that can be fulfilled through leashed walks. A lack of physical exercise can lead to destructive chewing. Care must be taken not to overstrain the breed. Overexertion can cause a softening of the joints and ligaments. Health – In the health department, Great Pyrenees dogs sport a tendency to suffer from heat stroke and to contract chronic canine heart diseases, dog allergies, patellar luxation and osteosarcoma. Proper dietary planning and regulation can help keep most of the concerns in check. The key is to make vet visits a regular affair. Handling and training this breed requires a seasoned pet owner with a dominant and confident personality. If you’re too kind-hearted, Great Pyrenees dogs might end up bossing you around. You must be able to provide adequate socialization and early training to curb potential aggressive behavior.